do you ever get the feeling in the pit of your stomach where you know that something awful is just around the corner? sometimes it can feel like you’re being slowly dragged towards the edge of a cliff because you have an anvil tied to your foot. no matter how much you claw at the dirt or grab at the surrounding bushes, you’re going over that edge eventually, like it or not. or something like that. that’s what i’m feeling right now, and it is making me sick. my guess is that cesc has made up his mind about next season already. why? cesc fàbregas, that’s why. for those of you who know me or have read the blog for a while, you know i have a slight obsession with fab4. so what if he plays for tottenham’s arch rival. who cares if he bleeds blaugrana due to his barcelona roots. is there something so wrong about liking a guy who fits the definition of a player i should hate due to my club allegiances? i love the way the kid plays: he is the master of the simple yet elegant. despite being a box-to-box player, he scores regularly (14 goals in 26 total appearances this season). and as you would expect from a central midfielder, he creates more goals than he scores (17 assists in all competitions). he shows for the ball all over the pitch, constantly putting himself in the right position to be an outlet. he plays the simple ball, rarely taking more than three touches. yet he does more with those three touches than arguably anyone else in england. it’s like he’s been playing with the brain of a 30 year old since he was 17 years old (i’m not quite going to give him the same credit for his first year playing in arsenal’s first team… but it was close). and cesc has been playing this way for so long that it’s easy to forget that he’s only 22. i mean he probably has another six years before he even really hits his prime. it’s no wonder the world’s biggest clubs are circling him like vultures. win the fàbregas sweepstakes and you get one of the best five midfielders in the world over a half decade before he will supposedly peak. if i were a club with £40 million to burn, that sounds like quite a deal to me. and it’s the idea of those circling vultures that has me feeling like i’m being dragged off that cliff. back in november, i wrote about arsenal’s desperate need to open their wallets during the transfer window. my reasoning was that if the gunners had any serious hope of keeping cesc after this season, they had to win trophies. and if they seriously intended to win a trophy this season, they had to set about bringing cesc some more help. so the transfer window has come and gone, and yet again, arsenal did nothing. wenger apparently felt content not to sign the target striker that everyone knew they needed, and would rather let an unfit bendtner try to fill that gaping hole. the french manager also seems more than happy to let a subpar goalkeeper (almunia) deputize their often porous defense. no one was brought in to help improve their defensive midfield deficiencies. arsenal and wenger’s inability to pull the trigger this january was effectively a giant “f*ck you” aimed directly at their best player. at least if i were fàbregas, that’s how i would take it. and after arsenal’s comprehensive loss to chelsea this past weekend, fàbregas might finally be willing to entertain the thought of inviting the vultures to the feast. the gunners’ deficiencies were glaring during the london derby contested between the two title challengers, and the glare was so bright that not even fàbregas could ignore it. picking up a needless yellow card, he was visibly frustrated at the end of the game. 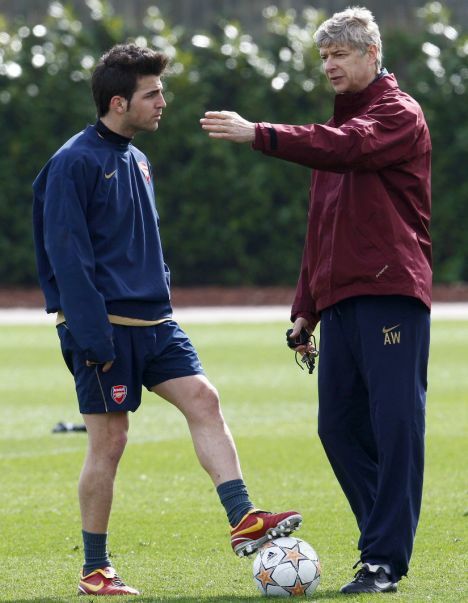 by not signing anyone this january, wenger might have inadvertently pointed fabregas towards the door. so why does the fàbregas entertaining the idea of leaving scare me so much? the biggest reason is his likely destination: barcelona. i can’t stomach the thought of my favorite player playing for the enemy, especially when you add him into an already barça’s already scary good midfield. the blaugrana have dominated all of the clásicos midfield battles the last few years. adding cesc to that mix will surely mean that madrid can continue to expect to be dominated in this arena for a long while. and though i get why he wants to go back to his home city and first club, that unbelievable midfield is the very reason i find this to be a stupid move for the young spaniard. you can only fit so many center mids on the field at a time. he’ll not be a guaranteed first team pick when competing with xavi, iniesta and the ever-improving pedro for one of two starting spots. but he’d be joining a championship pedigree club, drastically increasing his chances of winning that all too elusive silverware. barça have presidential elections at the end of the season, and both front runners are claiming that fàbregas is their number one target. real madrid are also vying for his signature, dubbing the endeavor “operation cesc.” although with real rumored to be offering gonzolo higuaín as swap bait in the deal, i’m not near as sold on the a move to the bernabéu as i initially was. so arsenal can likely expect a bidding war for cesc’s playing rights, resulting in a bid of around £40+ million that wenger would be hard pressed to pass up. secondly, i really don’t want to see cesc leave the premiership. his style suits the league extremely well, and watching him play week in and week out is one of my favorite parts of every weekend. and seeing as how the premier league is much easier to watch here in the states, it means i’ll get to see fab play less and less. oh and how could i forget how fàbregas’ departure would seriously dent my annual fantasy football plans. so, long story short, i think cesc is gone this summer. the chelsea loss was just about the last nail in the coffin for him. and unless arsenal can pull off a miracle and win a trophy this season (the league is out of the question, so we’ll pin all of their hopes on the champions league), you can pretty much book his moving van back to iberia. if i had any money, i’d be willing to wager a good deal of money on the boy leaving. and when the gunner faithful are enraged when the club sells off their best player yet again, they’ll know exactly who to look at. here’s hoping that wenger will be willing to face the fire on that day.